Have you made your menu yet? Do you have big plans? Are you doing something traditional (like eating Aunt Betty’s stuffing and playing cards with your grandpa), or something unconventional (like packing PB&Js and heading to the beach)? Tell me everything. I want to know! When considering what to share for Thanksgiving this year as an “entrée,” I struggled. So I went with my instincts and tried to think of something I would actually be excited to make and enjoy on the big day. I have yet to try a vegan “loaf” or roast I actually enjoyed, and I’m not much a fan of fake meats and the like. So instead of overcomplicating things, I came up with a whole foods-focused dish that’s simple, delicious, and something everyone can enjoy (picky eaters included). Swoon. Oh, and it all comes together in 30 minutes with less than 10 ingredients (depending on which toppings you choose). Happy Thanksgiving, indeed. 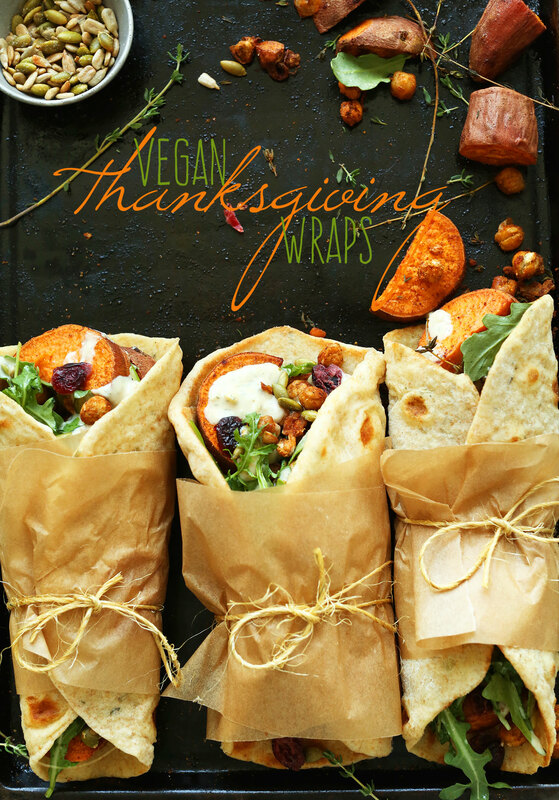 These wraps make the perfect vegan entrée for Thanksgiving, and also for any time of year! The flavors are so autumnal and warm and perfect, you’ll want to make these all the time (and you totally should). If you give these a try, let us know! Leave a comment, rate them (once you’ve tried them), and take a picture and tag it #minimalistbaker on Instagram so we can see! Hope you love these – cheers, friends! 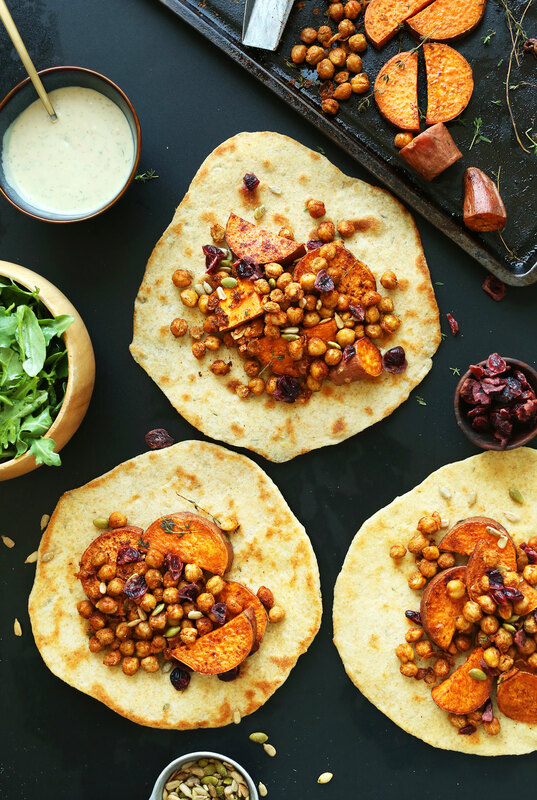 Healthy, hearty, 30-minute Vegan Thanksgiving Wraps with roasted sweet potatoes, crispy chickpeas, and garlic-dill sauce, tucked inside homemade Garlic Herb Flatbreads! Thoroughly wash and dry sweet potatoes, then slice (skin on) into bite-sized rounds/pieces. Add to a mixing bowl with avocado oil, thyme, cinnamon, sea salt and cayenne (optional). Toss to coat, then arrange in a single layer on a baking sheet. To the same mixing bowl, add rinsed, dried chickpeas, and avocado oil, thyme, cinnamon, cumin, paprika, sea salt, and coriander + cardamom (optional). Toss to coat, then arrange on baking sheet with sweet potatoes where space permits. (Depending on size of baking sheet, you may need to use a second to accommodate all potatoes and chickpeas). Bake for a total of 25 minutes, flipping/stirring once at the 15-minute mark to ensure even cooking. You'll know they're done when the potatoes are fork tender, and the chickpeas are golden brown, dehydrated, and slightly crispy. Remove from oven and set aside. In the meantime, prepare toppings and dressing (if using). 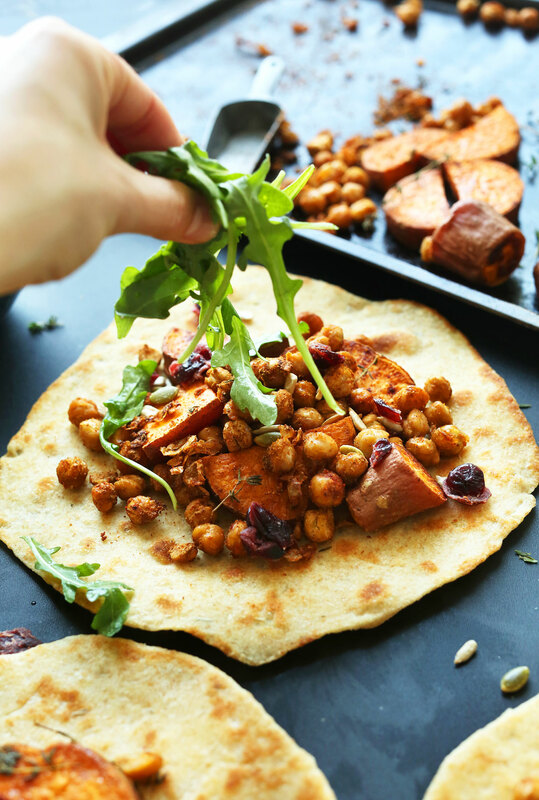 Once potatoes and chickpeas are finished baking, wrap flatbreads in a damp towel and warm in the still warm oven for 1-2 minutes (or in the microwave for 30 seconds) to soften and make more pliable. 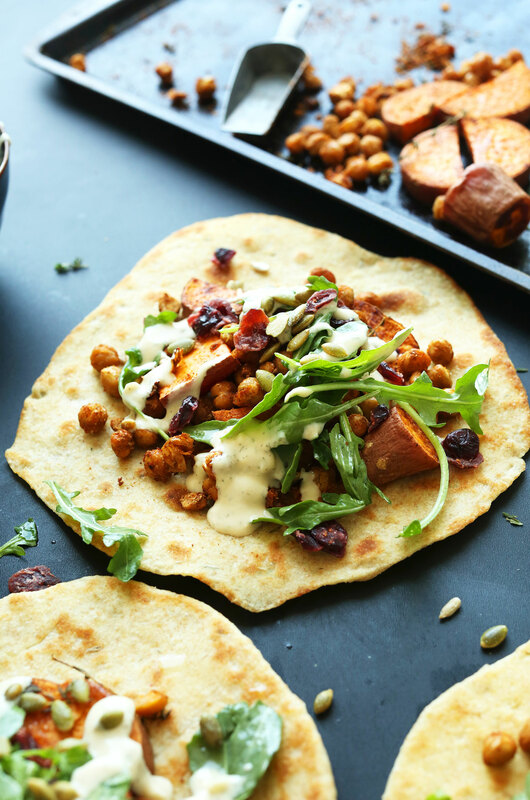 To assemble, top each wrap with a portion of sweet potatoes and chickpeas. Add desired toppings, such as dried cranberries, pumpkin seeds, arugula, and Garlic-Dill Hummus Sauce (recipe link above). Best when fresh, though leftovers keep separately in the refrigerator up to 3 days. *To keep this recipe gluten-free, sub the flatbreads for your favorite gluten-free wrap or bread or put everything atop a bed of salad greens. *Nutrition information is a rough estimate calculated with flatbreads, but without additional toppings. Made this for Christmas dinner! Everyone absolutely LOVED it. I do think one should allot more than 30 minutes prep time though…I mixed the sweet potatoes and chickpeas with their respective spices the day before, so they could “stew in their juices” and get really flavorful and I could just pop them in the oven Christmas day before dinner. I used store bought pita bread and it worked just fine. I had no pumpkin seeds, but sunflower seeds worked great! The only modification I made to the recipe was using soaked cashews instead of hummus for the base of the sauce, I felt like there was already enough chickpea flavor in the wrap. I went a little heavy on the lemon and dill in the sauce too, because I really like those two flavors. Bottom line, FANTASTIC recipe. Thank you so much for sharing it! I made this for my Vegan Grandaughter to take to Thanksgiving. We were due to go to in-laws and I didn’t want her to feel left out or awkward to have to pick around to see what she could eat. 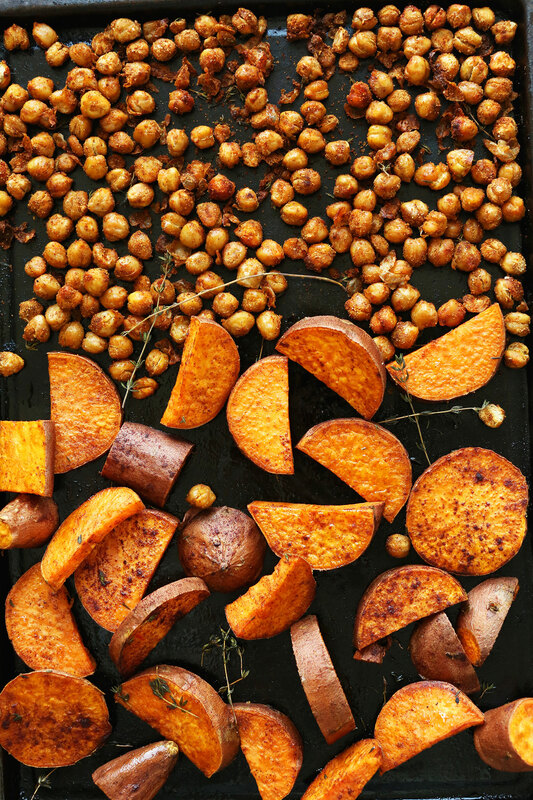 I made the chickpeas from dried, boiled and roasted with the sweet potatoes – they were nutty, smelled fabulous and held their form. The sauce, I included Tahini and some plain Hummus for texture. I made it two days ahead and refrigerated – it was (and is) SO delicious!! Using raw Pepitos – I mixed them with curry powder and a little sea salt – and roasted them. Instead of the flatbread, we used warmed ‘street’ soft tacos (the tiny ones). At Thanksgiving, we quickly microwaved the chickpea and sweet potatoes in a bowl, put the tacos on top, for 1 minute and then she assembled them on the spot. haha, thanks for sharing, Penny! This was amazing and a huge hit at thanksgiving! Only downside was that there wasn’t enough for everyone to try. Would it be possible to cut the dough into smaller pieces for bite sized versions? Would this impact the cooking time of the bread if they are smaller or still be 2.5 minutes per side? Thank you for the amazing recipes as always! Oh, I think the cook time would still be the same. And that’s a brilliant idea! Like a little finger food / appetizer portion. xo! We had these for dinner tonight – delicious! To save time I used Trader Joe’s Garlic Hummus Dip, store-bought naan bread (which I warmed), and Trader Joe’s Cranberry Sauce. Added the arugula too. So yummy! you are an amazing creator of really healthy delicious recipes, you inspire me tremendously ! love your ideas and concepts. keep up the great work and give others like me inspiring ideas. thank you so much. Anyone have tips on how to help these come together more quickly on the day of the event? I feel like the sweet potatoes could be roasted the day before and heated up in the oven before assembly. How about the chickpeas? I’m assuming assembly should be done before serving, but any prep suggestions would be appreciated! Would you put butternut squash in as well as the yam? or too much? I just made this for Christmas dinner. It’s amazing! A new favorite! I followed the directions to a “T” and everything turned out perfectly. I wouldn’t recommend changing a thing. Absolutely delicious! This has become our holiday go-to. Was searching for it again for Christmas in a couple of days, and wanted to leave a quick note about how great it is. We LOVE it, I don’t know why we don’t make it more often, but I guess that keeps it special. Thanks for all the great recipes! This was outrageously good. I used all the add-ons (pumpkin seeds, cranberry, arugula). Made these for thanksgiving. I was totally intimidated by the flatbread, but it was SO easy and the wraps were delicious and even my non plant based friends loved them! Highly recommended!!! Can I sub olive oil for the grapeseed oil? On the Thanksgiving wraps how do you think Goji berries would work in place of dried cranberries? Have you ever done a roasted stuffed pumpkin? I haven’t but I’ve always wanted to. I think it would look really cool on the Thanksgiving table. I saw one recipe that had about 20 ingredients, from black beans to tofu to walnuts to craisins. I haven’t! But that sounds lovely. Hello, Dana. So, I wasn’t sure how thia would come out, but I took a step on faith haha and cooked this dish. It turned out fantastic! My entire family was begging for more. Thank You. Will you be posting any Halloween specialties? I’ll be sharing many on social media. Stay tuned! Absolutely delicious! Had these with the curried butternut squash soup, definitely making both for thanksgiving this year! As usual, these were absolutely delicious, thank you so much for the consistently great recipes! These were so good!! Made the sauce, chickpeas and sweet potato, topped on a pita/flat bread with just plain old lettuce and tomato. Love, yum! I thought that this was going to be a leftover sandwich in wrap form – but this is even better!!!!! I can make and eat this in March – right? I’m thankful that no one is going to make me wait till December…. Ok. I was a little skeptical about this one, particularly when I tastes the sauce and potatoes separately. But together, WOW. Love it. Thanks for the recipe! I don’t normally like sweet potato, but that was amazing! The amount of spice on the chick peas and sweet potatoes was perfect to compliment the garlic hummus. I didn’t have dill, but it still tasted delicious! I also made the flatbread and it was so good; I kept eating the bread with the hummus after I was full. I’ve been waiting months to make these and I’m so glad I finally did! Thanks for the recipe! Tried these tonight, delicious! Flavorful and easy. The sauce, yummy! Great for NYD! These were a huge success at Christmas this year! The flatbreads were so easy to make and took the entire dish to another level. We will definitely be making these again. I recently made these for a Christmas potluck at my work and everyone who tried it really enjoyed them! My boyfriend was not even able to try them, they went so fast! I made 12 wraps. I substituted a few items, but overall the wraps were so beautifully presented. That garlic herb sauce definitely brings it all together. I’ll definitely be making these again when I get the chance! So great! Thanks for sharing, Gabriela! I made these for a special Chanukah meal and they were DELICIOUS! We enjoyed them so much. Will definitely be making them again, especially the flatbreads. Hello. I’d just like to say that I tried this recipe for a couple of my vegan and vegetarian family members, and they loved it!! They requested that I make the wraps, again. Thank you. These look so delicious!! I love chickpeas! Tried the Vegan Thanksgiving wraps. Used romaine leaves instead of bread – they were to amazingly good. I also used a squirt of Ponzu sauce and it was just perfect. I swear, I’m eating this recipe (and variations thereof) about twice a week at the moment. I love roasted chickpeas. I love roasted sweet potato. I love your hummus dressing. I love rocket. This is literally my favourite meal of all time. The only reason I’m not eating it every day is that I don’t want to get sick of it! Dana, I really want to THANK YOU for this amazing recipe! I would never have combined cinnamon, thyme and dill but this was SO good and a great reminder to grab my dill more! We improvised a little and used sultana raisins instead of cranberries, and a butternut squash instead of sweet potatoes but the rest was as close to the recipe as I ever get. Next time I’m going for rocket salad (but I can say that spinach and some green onions was a great option too) because I have a feeling the pepperiness of it will be amazing with this. So… THANK you! Love this! These were a hit!! Made them for my vegan daughter. Hi, I’m making these this Thanksgiving but I have to transpirt them. Are they best served warm or is room temperature good? Can I make the filling the night before? Thank you! I’m going to be planning my first vegan Thanksgiving, and I’m going to try out several of your recipes. Everything looks so good! This was great. I made my own flatbread and made the chickpeas from dried, so it wasn’t q quick meal to throw together, but I now have lunches for a substantial part of the week all done. Loved the garlic dill sauce (although I think people may have to stay away from me for a little while..!). I put arugula, sauteed kale, sweet potato, peppers, and the roasted chickpeas in mine. I am not sure the roasted chickpeas did much for me, even fresh out of the oven. I think next time I might just season them after cooking and skip roasting them. I like when they are creamy rather than the texture of roasted. This is also a great template. You could do any number of combinations in a flatbread wrap. Made these tonight and they are delicious! We ran out of arugula yesterday, and I’ll add it next time, but it didn’t need it. Served them wrapped in the frozen garlic naan from Trader Joes. My 3.5 year old loved it too; I served it “deconstructed” with the toppings in separate ramekins and she made her own combinations. So tasty! So great! Thanks for sharing, Chelsea! Thank you for this and for all your recipes – I cook at least one or two new ones each week and some of them (like your tahini dressings) have become standard fare in our house. You are making my life more of a blessing and sharing with others keeps the love going. I am grateful for you and your love of cooking. Such an easy recipe, yet it tastes so good! I am totally going to save this one, thank you. These look SO good!! I haven’t discovered a suitable gluten free wrap for these but I am in love with all these flavors! Dana!!! Your picture are so mouth watering! I want to jump through the screen and chow down! You are awesome! Can’t wait for your book to come out! My brother recently decided to go vegan and I have been racking my brain on what to serve him for Thanksgiving. These wraps look so delicious I might have them too. I think he would love these! Let me know if you decide to give it a go, Nicole! OMG! These look soo incredibly good. You made one picky vegetarian in Holland extremely hungry!!! Who needs fake meat when you can do that with real veggies??? WOW! Ha! Agreed. Hope you all love these! I work 7 days a week for about two months straight until the holidays hit, so the simpler, the better for me. If I could get takeout, I would in a heartbeat. Luckily, my time off starts at Thanksgiving this year, and I only have a couple of major events between then and the new year. Both my husband and I agree, fake meats just don’t cut it for the holidays. Never mind the endless tofurkey jokes from our families, we’re just not big fans. We like to make whole food dishes that celebrate the season without a lot of fuss. Last year was acorn squash and chestnut soup, hazelnut crusted tempeh with mashed potatoes, gravy and roasted Brussels sprouts, and maple creme brullee for dessert. It sounds difficult, but most of it was made ahead of time or required very little attention. This year, I’m thinking persimmon and (vegan)ricotta salad, cornbread and cranberry stuffed mini pumpkins and a platter of things dipped in chocolate for dessert. There’s not a lot of fuss, but it still feels special. Love your approach! That Thanksgiving sounds lovely to me! I cannot believe Thanksgiving is next week- How did that happen??? I saw Ina Garten’s Thanksgiving episode with Bobby Flay last week and started to get those holiday warm and fuzzies :) I go to my aunt and uncle for Thanksgiving with my family and I usually bring one or two things.. if only I could narrow down my options and commit to a dish! Mmm, the holiday warm fuzzies. LOVE them. I am holding off on listening to holiday music until after Thanksgiving. Wish me luck! These look ah-mazing!! Do you think they’d keep well after some time? I’m having my first ever Thanksgiving with my husband’s family and, since I’ll be the only vegan there, I need to bring something of my own and I really want to impress with a good dish that everyone would love! I would recommend keeping the ingredients separate and assembling as close to serving as possible! Okay, thank you so much for responding! Ah, thanks Claudia! I often forget it’s not Thanksgiving for everyone! Still hope you love these wraps! I’d eat these wraps any day!! Can’t wait to try the garlic dill sauce. DO IT. And report back, friend! This looks good and I’m sure I’ll try it. That said, we’re going a bit more traditional for our Thanksgiving meal. However, last Christmas I made your vegan shepherd’s pie (I included baby bella mushrooms and a splash of balsamic vinegar which were both fantastic additions) and it made for an awesome holiday meal. I paired it with a side dish of brussels sprouts and some cranberry relish. For Christmas I’m leaning toward the shepherd’s pie again. Me too! Can’t get enough of that shepherd’s pie! Ha! Thanks friend! Hope you give it a try! These look absolutely delicious! :) Filled with tons of healthy ingredients that I love! Thanks Dani! Hope you love it! I can’t believe is Thanksgiving next week, crazy how time flies! These look and sound sooooo yummy! Any thoughts on a good substitute for chickpeas (just don’t love the taste) ? Thanks ! What about white beans? Or, double the sweet potatoes and add more pepitas and sauce! So much yumness!!! These look so, so good! This is exactly what I’ve been thinking of, but as a salad! Now I’m thinking about flatbread croutons on the side. Ooh smart! Let me know if you give it a try! These look incredible!! I’m thinking this is the perfect recipe for my I-refuse-to-step-foot-in-a-store-friday! Ha! Agreed! Hope you love it, Mason! Your recipe for garlic herb flatbread is not available on your site right now. Are you having problems? I can’t wait to make this!! 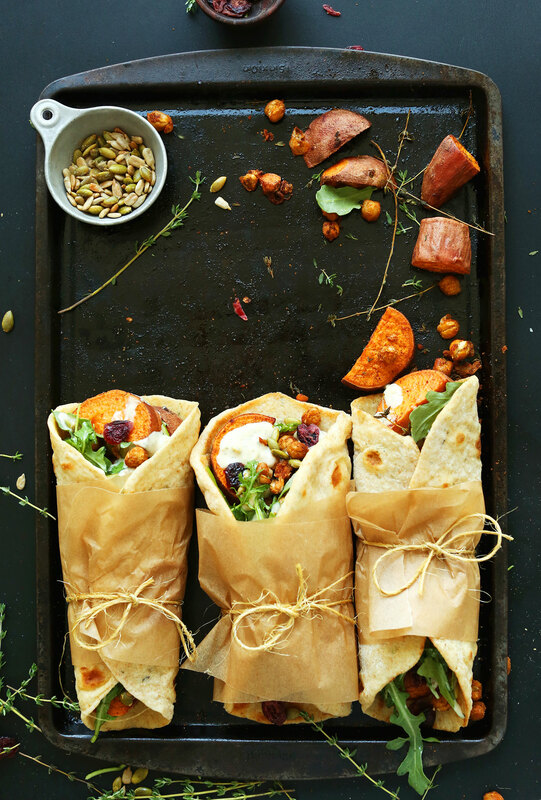 We don’t celebrate Thanksgiving here in Australia but I want these Thanksgiving wraps! You totally should! They’re great year-round! Love the photography and styling! This sounds like the perfect dish for your light Christmas meal! Hope you love it, Natasha! It’s going to be just me for Thanksgiving, as my partner will be working and eating there. These look so good and easy to make, I’ve decided that this will be my meal. I may add some wild rice. This would be perfect for a single lady Thanksgiving! Hope you love it, Kayleigh! yummy, these looks amazing! 100x better than tofurkey for Tgiving! This is such a fun way to celebrate Thanksgiving Dana! Sweet potatoes are so representative of the season. I love the spice mixture. Can’t wait to try this. Yay! Let me know if you do, Dawn! Love alternative Thanksgiving dishes! And that garlic herb flat bread looks bomb.com – well done, Dana! Oh, Dana, I LOVE that garlic hummus sauce!!! Plus, a love affair with sweet potatoes and anything wrap/sandwich-y makes me really, *really*, REALLY want to try this, like yesterday!!! Gosh, I wish I was your neighbor/friend/person-who-gets-all-your-extra/”failed”-food!! Thanksgiving will be pizza for our family…unconventional for most people, but a semi-traditional treat for us. Probably a movie on the couch, too, for the ultimate relaxing family bonding time. ? Ha! I’ll let you know when I’m hiring a failed recipe tester ;D Hope you love this, Hannah! Hope you love this one, Emily! Thanksgiving has already past in Canada, but I think I might just need to make this anyways! So many flavours I love together in a cozy wrap! This is sheer genius! I feel like this is something I would order at an upscale lunch cafe. How impressed would all my Thanksgiving guests be if these were packaged up and begging to be devoured?! Ok…you asked! Hee…..I hope this isn’t too long winded! It’s going to be a joy packed holiday! My husband and I will start our ThanksLiving Day by visiting the Tualatin River National Wildlife Refuge outside of Sherwood for an early morning walk. While walking through the peaceful refuge enjoying nature and spotting birds and hopefully other critters, we will talk about this past year and what we did and how we can do more and give more next year. In the early afternoon, I’ll get in the kitchen and start the cooking fun! I’m so happy we will be joined by two friends who live alone and would have not made a dinner. The more , the merrier! I’m preparing a VegDucken as the “roast”. I’m so excited to try this beautiful creation of a hollowed out butternut squash, stuffed with a hollowed out eggplant, stuffed with a hollowed out zucchini then stuffed with a “cheesy” mushroom stuffing made from the leftover vegetables scooped out. I think this dish will be a real stunner! My husband requested mashed potatoes with mushroom gravy and I’ll be adding a pretty side salad of grated beets and carrots, apples, roasted walnuts. I’ll either make a pear tart using our local Clear Creek Pear Brandy or a pumpkin pie topped with coconut cream whipped topping for dessert. I might make both! After dinner we’ll enjoy a sniffer to two of Gran Marnier or Armagnac and some good conversation. Friday: We won’t be doing any Black Friday shopping or going to the mall or eating in any restaurants. We spend the day quietly and usually in nature. We plan on a long forest walk and I’ll be taking pictures of pretty and interesting beauties growing on the forest floor and later we will be getting together with friends at our favorite beer/wine stop, Uptown Market for a local craft beer and some conversation. Saturday: A friend and I will be attending the Vintage Christmas Show at the Monticello Antique Mall which is located on SE Stark. We LOVE this event! It really gets me in the holiday spirit ! And I always get inspired to do some fun Xmas crafts. Sunday: My husband and I will be volunteering at the Wildwood Farm Sanctuary in Newberg. I can’t wait to visit with my furry and feathered friends! I’m taking all my fall pumpkins and squashes that I used for Halloween/fall decoration and a big box of apples from my orchard as a treat for them. We’ll be mucking out stalls, laying in new bedding, doing building repairs and general cleaning and I’ll be doing a lot of hugging, cuddling and petting. It’s the perfect way to create and manifest a different meaning for this holiday. Let’s make this holiday about living and loving and celebrating every living creature on earth! Be kind and Happy ThanksLiving, Everyone! You have your weekend all planned out, and it sounds wonderful! I didn’t know there was a Farm Sanctuary in Newberg! Hope it’s a great time! Thanks, Dana! I hope you and your family/friends have a super holiday! i am so with you on fake meat thing, I don’t need a substitute I just want delicious veggies and grains. Last year we made some delicious Wellington inspired puff pastry wrapped veggies with lentils it looked so elegant and tasted delicious. This year I am doing a variety of small dishes. Roasted sprouts, onion and butternut with pomegranate glaze, potato gratin, fiesta corn (peppers, onion, saucy stuff), stuffing and rolls. Happy Thanksgiving and thanks for the wonderful posts. Yum! Do you have a recipe for the Wellington? That sounds amazing! I’m not familiar with “wellington” but will have to research it! Yum!!!! Would love your Wellington recipe too! This would make the perfect road trip food! Hope you love it and safe travels! Warm and pillowy are some of my favorite food adjectives. You hit the nail on the head with these, Dana! Well, our family plays Rook. It’s the family game and if you don’t play, you’re on the outside looking in. We love Settlers of Catan too and sometimes Ticket to Ride. 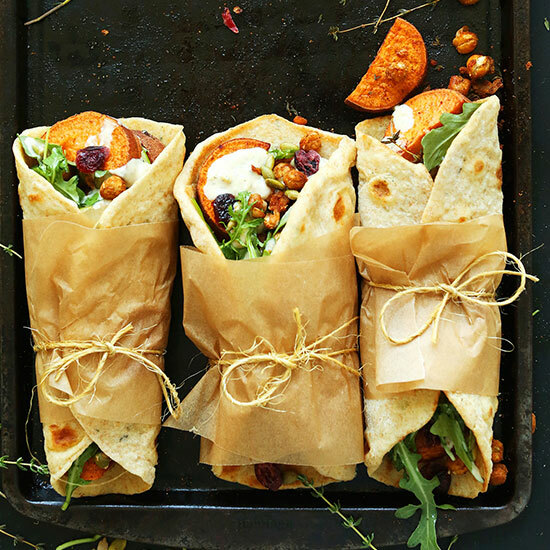 These wraps look ideal for the day after Thanksgiving when you’re still wanting that sweet potato feeling but am tired of Thanksgiving foods. Settlers of Catan gives me anxiety. Ha! I’m not a strategy game person. But your day sounds lovely! Wow! What an insightful dialogue.